About Rabbits for Show and Hobby. Tips and Tricks for novice and expert alike. In 2003 I sat down with my son (in 3rd year of Electronics at the time) and an older friend (working in mechanical/electrical manufacturing) and said, "there has to be an easier way". It had to do with my hobby of raising and showing rabbits. In the winter there is nothing worse than having to handle frozen water bowls. It's not good for the rabbits (no water then they don't eat) because they get out of condition and don't grow properly and it's no good for me because it's a painful chore in the cold weather. We came up with an idea to heat the water bowls using low voltage making it safe. My son and I wired up a transformer, added the components to a metal water bowl and set it out side one January night in 2004. It was so primitive I only had a pail to cover the transformer from the elements. It was a cold night...at least -10 Celsius and behold the water was not frozen! I couldn't believe it. From that early experiment, the following fall I set up all my cages (50) wiring up all the water bowls and installing the transformers. That first winter (2004-2005) I experimented with different types of bowls (plastic & metal) , different sizes and different amounts of power to the bowl to find the best working arrangement. By the winter of 2005 -2006 I had it working very well. Seldom does the water freeze. The average temperature in my area in January/February is -10 Celsius and the bowls don't start freezing till -15. I have used this system for heating water bowls for my rabbits every year now since 2005 and it saves me a lot of hassle, pain and frustration. I enjoy looking after my rabbits in the winter! Preparing Your Rabbits for Show Day! The big show day is approaching and you need to get your rabbits ready to show. So what do you do? Seasoned breeders have their own process. A lot depends on how much time you have or are prepared to invest. I’m a keep it simple kind of guy and prefer to keep to the basics. I usually show a lot of rabbits and time becomes an issue. So let me share with you my KISS (Keeping It Simple Silly) basics for getting your rabbits ready for show day! 1. If you plan on showing you better start six to eight months or more before the show. These are the maximum age dates for many of the breeds. If you want to have the best advantage on show day; you want to have a rabbit at its most mature age for the class. A more mature rabbit will be better developed and has a better chance of beating the competition. Check with the Standard of Perfection for the breed you raise. If you plan on showing in the fall at let’s say an October show; if you want Intermediates you start breeding in January and for Juniors you breed in March. If I plan on showing at a major show like a National show that was on let’s say October 15th. I would be breeding on January 10-14 and March 10-14. This would give me the best prospects for maturity for Intermediates and Juniors. Now a problem I have in raising Californians and New Zealands is that my rabbits will often be overweight if I breed as outlined above. But because I know that; I will compensate by breeding some does almost 4 weeks later. So often my rabbits will be 5 months and 7 months old and have reached the maximum weight limit for that class. But you have to know your rabbits and you have to know the Standard Book! If you plan on showing at several shows you can just average the breeding dates in order to get as many of your rabbits to the maximum maturity. 2. Start selecting your show prospects. My first cull is when the kits are twelve weeks old. This is the time when I remove the obvious misfits and runts. My next cull is at five months of age and at that time I also tattoo the ones I’ll be keeping. I wait till five months because I have found that this is the time they really begin to show if they have what it takes. They will still change but you can already see the strengths and weaknesses. The overall body balance, fullness in the hindquarters or a low shoulder are much easier to see. Now they still may be culled later, but these become the core group I now focus on getting ready for the show. Other breeds and especially the marked breeds can be culled sooner. Some will be later than I have outlined above. 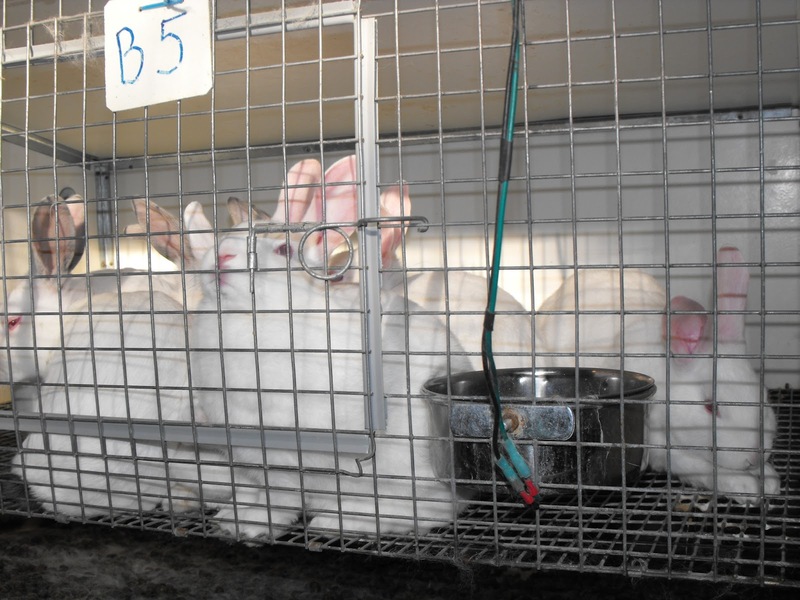 You need to know your rabbits and the best times to cull. Talk to other breeders in your breed for their suggestions. The point is that you should be culling along the way in the process. 3. At about twelve weeks before the show I start feeding a conditioning mix. This is a mixture I add to feeding time in order to help them firm up in flesh condition. If you do an internet search on “conditioning feed mix for rabbits”, you should find various mixtures that breeders use. Again, mine is a simple mix of western double cleaned rolled oats, black sunflower seeds (7:1 ratio) and a supplement oil. I mix in just enough oil to wet the mixture. I use Healthy Coat Apple flavoured supplement oil because it will not go rancid and the rabbits really like the apple flavour. I limit feed so the feeders are always empty when I start. I feed the conditioning mix first (about a tablespoon/rabbit) and then come along later with the pellets. This stops them from scratching out the mix from the feeder. 4. The week before the show entry I look over all my prospects checking weights, disqualifications, coat condition and overall quality compared to the Standard. From this evaluation I make my entry. 5. Those rabbits that have made the entry, I’ll now groom for the show. This involves spraying a mist of water on the fur (Dollar Stores usually have inexpensive spray bottles) and then working the coat back and forth with my hands until it is dry and thereby removing any loose fur. If it’s a Senior entry I’ll clip the toe nails if needed. I usually find that Juniors and Intermediates don’t require this to be done. If they have a hutch stain I use a sprinkle of baking soda with a wet paper towel to work into the area affected. I have also used peroxide on bad cases. I will repeat this grooming on the day of the show either before I load them at the barn or in the show room. In conclusion I want to stress that you should be doing all you can to make your rabbit be the best it can possibly be when it finally is picked up and examined by the judge. There are many things about your rabbit you cannot change. Those are the things that come from genetics. Do your best at starting out with the best breeding stock you can attain. But the cosmetics of grooming and cleaning can and should be done. 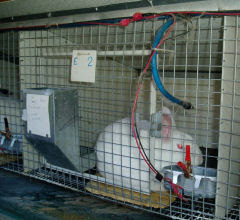 A filthy or ungroomed rabbit on the show table says more about the breeder than the rabbit! Show day says as much about you as it does your rabbits! Have a great rabbit show and above all meet and enjoy the many other people who share the hobby! 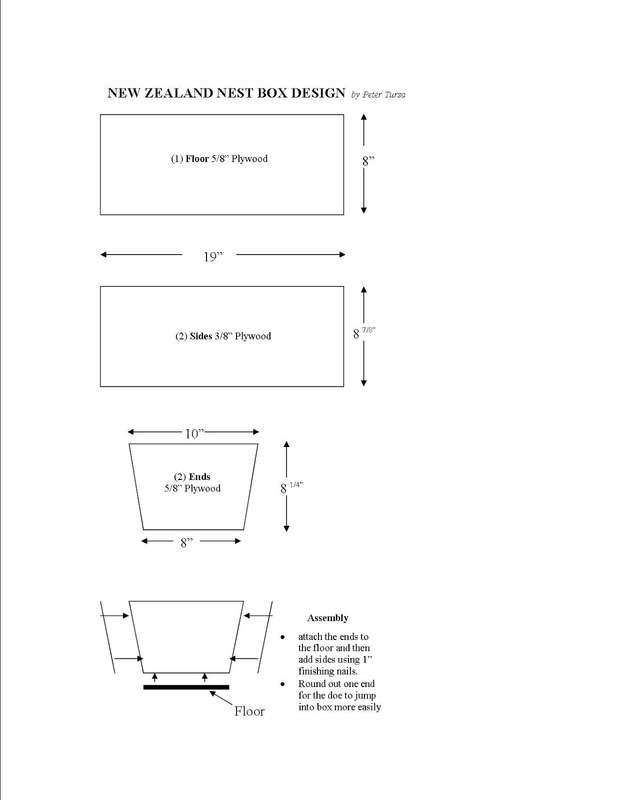 Nest Box designs come in all sizes, shapes and materials. I’ve just put together some ideas that I’ve used that may be helpful for the beginner or even the seasoned breeder. First thing to consider is will the box I build fit in through the cage door! It’s amazing how often we don’t think about the obvious. Second, the box has to be large enough for the rabbit using it and third will it be easily accessible by me the breeder when checking on the litter. I make my nest boxes out of plywood and use wood bottoms. I know that many breeders don’t like the wood bottoms because they retain the urine and droppings but it’s always worked for me. However, it’s important that at around the 10 day mark after kindling to go into the box and replace the soiled material with fresh stuff. Does the trick for me. If you don’t replace the soiled material you often get eye problems with the kits such as their eyes not opening or getting infected. In the summer I collect fur from does that pull an abundance of fur. I place this collected fur in a bag that breathes (I use my feed bags which are a woven plastic type) and hang them up in the barn. Then in the winter when I have a doe that does not pull enough fur in the cold weather I just add fur to the nest box from the summer supply. The receiving doe is not bothered by it and it helps to keep the kits warm. See the next post for my design and assembly instructions for building wooden nest boxes. If you have found this article helpful or have suggestions you would like to make; feel free to contact me via www.Tursaco.com in which you’ll find a contact page.